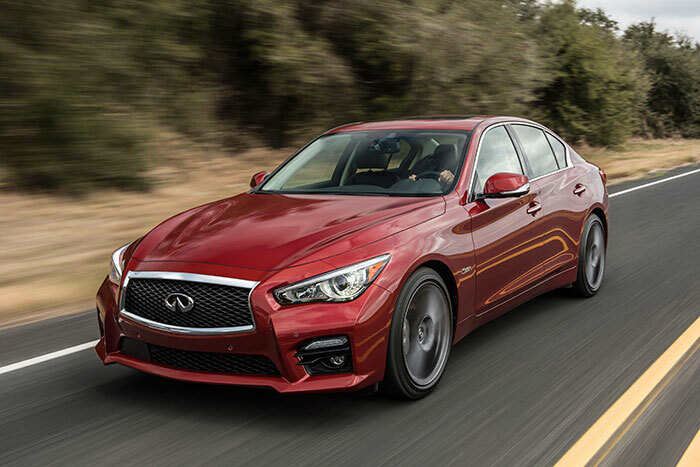 Infiniti has announced the starting price for its flagship performance Q50 flavor called the Q50 Red Sport 400. The car has a 400hp 3.0L twin-turbo engine under the hood and is offered in rear-wheel and AWD versions. The 2016 Q50 Red Sport 400 RWD starts at $47,950. The AWD version of the car starts at $49,950. Both versions of the car will also include a $905 destination and handling fee. In addition to the powerful twin-turbo V6 engine, buyers also get a sport styled front fascia, sport brakes with 4-piston front calipers and 2-piston rears. A new rack-based electronic power steering system is available. The seats are leather with aluminum trim accents. The exhaust gets brushed-finished tips and special 19-inch wheels that are staggered for RWD versions. Pricing on the Q50 variants with the 2.0L turbo four and the 3.5L V6 hybrid are $33,950 and $47,050 respectively. Pricing for the 300hp 3.0L twin-turbo version will be announced later.